New Zealand director Peter Jackson, best known for his Lord of the Rings trilogy, has made an enduring cinematic contribution to the centenary commemoration of the end of World War 1. Working with the visual and oral archives of the Imperial War Museum (IWM) and the BBC, Jackson has used state-of-the-art technological wizardry to bring to wondrous and often disturbing life old black and white footage of life in the trenches. Not only has he restored (subtly realistic) colour to the images, something we have already seen done more crudely on various TV doccies, but he has also slowed the jerky, speeded-up Charlie Chaplinesque footage we are used to seeing from that period, creating an impression of reality for the viewer who suddenly feels himself a true witness to the terrible events that took place in the French and Belgian mud from 1914-18. The moment when this technique is first used, after the soldiers have arrived in Belgium, gives the audience a powerful jolt as it thrusts us into their lives. The sense is that no longer is there a barrier between those seemingly distant soldiers and our contemporary eyeballs. Increasing this sense of reality, Jackson has also used lip-readers to occasionally identify the speech of soldiers at the front (with actors speaking their lines). This, too, adds to our sense of being witnesses rather than distant onlookers. There is no traditional narrator, with Jackson using the voices of soldiers interviewed by the BBC and the IWM to describe their experiences, ranging from their food and drink, sanitation (including lice, rats and primitive toilets) and, of course, their emotions when confronted by shot and shell. The director’s uncanny ability to sync these voices with the images he chooses is remarkable. 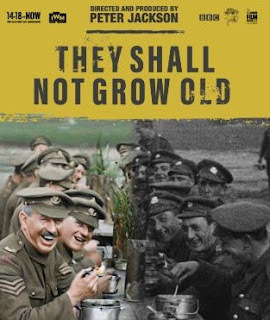 They Shall Not Grow Old has an intentionally limited focus, starting with British civilians volunteering for military service in August 1914. We follow their six-week training period before they are transported to the front. After this, most of this 89-minute film is about what happens to them in the trenches, before a coda that offers a sardonic assessment of what happened to the survivors when they returned to an uncaring civvie street. Because of Jackson’s decision to eschew a traditional narrator, the film doesn’t fit an ideological straitjacket and is all the better for it. We don’t get a vision of the meaninglessness of the war, or the bloody buffoonery of the generals, associated with the likes of Siegfried Sassoon, Wilfred Owen ... or Black Adder, nor do we get the revisionist “it was worth it after all” associated with some modern war historians. Instead, we get the muscular, unvarnished reflections of the ordinary soldiers who were there; who explain why they went, what they felt and how they handled the dreadful pressures of trench warfare. Along the way we get a fair amount of humour, a lot of English sangfroid and typical understatement. We also, it must be said, get an eye-popping insight into the poor health of the English working class at the time, judging by the dreadful state of their teeth. Having said all that, we are never shielded from the horrors of war. One of the most dramatic sequences is the buildup to a major offensive, and Jackson has chosen footage of clusters of men waiting to go “over the top”. We see absurdly young faces, fixed in the rictus of terror, gazing at the camera in what must have been minutes before the whistles blew to send them, in all likelihood, to their violent deaths. Fortunately, perhaps, there is virtually no genuine footage of real battle scenes in WW1 and Jackson handles this blackout cleverly, relying on sound effects to convey the sounds of the guns and then shifting his camera from real shots of soldiers in waiting to equally real shots of dead soldiers after the fighting has taken place. Time and again throughout the film, we find Jackson returning to those soldiers’ faces, creating an increasingly haunting impression. As already mentioned, the film doesn’t use a traditional narrator, but it also doesn’t narrate the war. There is hardly a mention of a town or city or a particular battle. This is a movie about the soldiers’ experience of the conflict, and Jackson’s considerable achievement is to bring us closer to these ordinary men than I thought possible. It was disappointing to note that, on a cut-price Tuesday morning, my partner and I were the only people in the cinema. Those who wish to see this remarkable film should get themselves to Gateway as soon as possible.